At Apple's "Education Event" at the Guggenheim Museum in New York City, the company unveiled reinvented textbooks, calling them a "new textbook experience." The freshly introduced books are graphical, interactive, and take advantage of features such as 3D imaging, embedded video, and multi-touch gestures. The books will be available for the iPad users to download directly from the iBooks Store. If you’re wondering how the publishers will manage to make those new iBook2 textbooks, here’s an answer for you: there will be a new Mac app rolling out, as Apple announced. The new assisting app will significantly facilitate to design and format these new interactive textbooks, allowing users to embed HTML, 3D objects, interactive image galleries, Q&A, and so on, and allow the creators to publish their work to Apple's iBookstore directly from the app! Moreover, the authors will be allowed to update the published books, in case there are some typos and other petty errors captured. iBooks Author, allowing you to create dynamic, current, engrossing, and truly interactive e-books, is available for free in the Mac App Store for everyone who desires to become an early adopter! Few of the iPad-based education program partners were also announced, including Pearson, McGraw Hill, and Houghton Mifflin Harcourt —together making 90% of the textbooks currently available in the US! The companies mentioned will be filling the new "Textbooks" category in iBooks 2 with high-school level textbooks, and are piloting the new iBook Author app as well. Covering every subject level of study for high-school students, the textbooks will be available for $14.99 or less at launch – while the publishers will be able to set their own prices, but only in return for selling them exclusively through iBooks, so $14.99 appears to be the standard option by now. 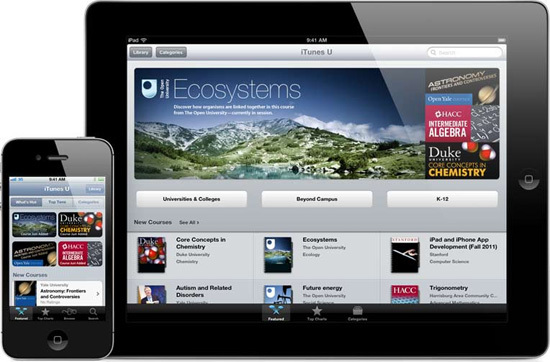 The event was noteworthy for one more thing – iTunes U offering by Apple, for syncing your iBooks textbooks to your iPad. While Apple's Eddy Cue unveiled the new iTunes U app, designed to look a lot like iBooks 2, strictly a portal for accessing all types of educational materials, including a class syllabus, full course notes and videos, as well as iBooks notes. Apple has teamed up with some of the world's top universities such as Duke, Harvard and many more, suggesting them to offer course materials for the part-time students as well, including lecture videos, quizzes and so on. Furthermore, though iTunes U used to only be accessible for the University students and lecturers, Apple has now made the app accessible to K-12 school districts, universities, and colleges in 26 countries! 1. An iTunes Store account is required to access iTunes U course materials, so you should create an iTunes account first. 2. iBooks textbooks are readable only on iPad. As a conclusion, it should be said that the era of heavy and dull textbooks is over! Although no iPad3 or iPhone5 was announced, the students now are still much luckier to have as strong and considerate supporter as Apple. Let us know your thoughts about iBooks Textbooks and iTunes U below in the comments!